I had NO IDEA there were creatures like that in the North Carolina woods these days! I'm glad they're not extinct as I imagined, (and I'm sorry this one didn't make it) but how many times did I come close to being cat food? I will never leave New York again. Sorry, mom. I saw a dead kitten today and I could see its small skull. It was on the sidewalk(footpath). I took two pictures. So sad. When we lived on a farm, there was a couger not 50 feet from our house! It was pretty cool! RI: OK, I'm going to stop trying to disgust you. Cause I think you might just have a super-human tolerance for grossness. I had assumed that you used to live in Texas (because you said that Austin was the 2nd best city in the world. )but North Carolina....I was way off. My music teacher told me today that we wouldn't have a lesson next week because she was going to New York. I smiled, thinking of you. I asked her if she would be playing in a group there. She said she would be, but not in NYC. "But I'll be playing in a master class in the mountains of North Carolina." To everyone who doesn't want to give out their personal email addresses to vote for Ananka's Diary, I give you three words and a website. That's exactly what they are! Give out your pookmail address to the Blogger's Choice Awards, and vote away. Your personal information is safe. Poor thing! There was this cat that kept coming in my backyard because I have two cats of my own. I felt sorry for it and I fed it a couple of times. One day I noticed that he had some sort of disease. His throat had a hole in it! Yes, a hole! And another hole next to it, you could see his actual bones! I asked people if he belonged to anyone but he was homeless. So I had to call the animal people to get him collected. It was so sad, they said he might have cancer. Wow. 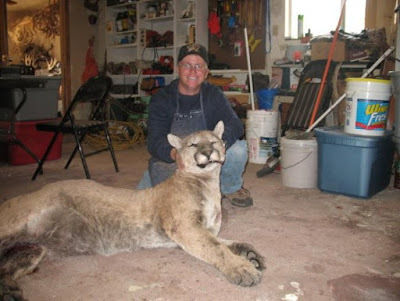 That is not a small cougar. It's much bigger than the one in the local zoo. I wonder how many cryptozoological sightings that fellow inspired..
that is so cool!!! i have found lot's of cuogar bones, and i love to play with them!!! (weird?) i live in NC to!!! i have lived here my entire life, and my granny lives up in that area. Liltomboyblue: Where does your grandma live? I grew up in Sylva. I hope the cancer cat gets well soon!! she lives on a mountain a little outside burnsville. it's in the blueridge parkway area. random irregular: that is extremely sad. is there some grudge against cats these days? alot of them seem to be getting killed/dying. irregular kiki: o my god, that is so sad! just a hint: is you REALLY want to be grossed out and disgusted, read the Demonta series. i could only get half way through one book. they are vile and disturbing, and i'm pretty tough when it comes to those 2 things. they literally made me neasous (?? ).